After all the diesel emissions cheating fiasco noise, finally some positive things to say about Volkswagen. 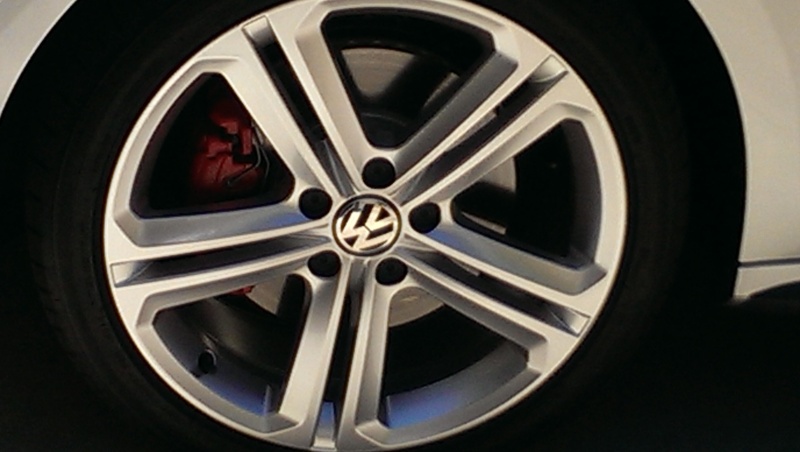 I like VW products, and I generally have great respect for the engineering and carmaking prowess of the company. 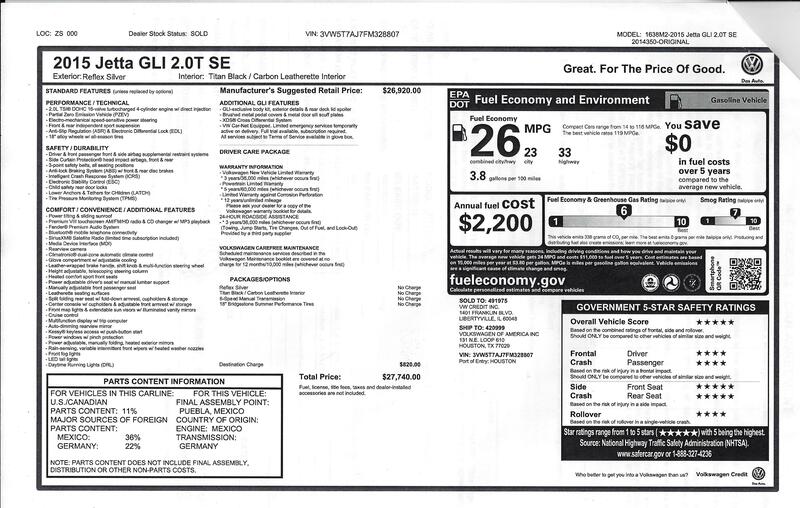 Yes the emissions testing debacle was a major mess up on the company’s part, but we’re not here to talk about that. Four doors and a trunk, just how many sedan buyers like it. 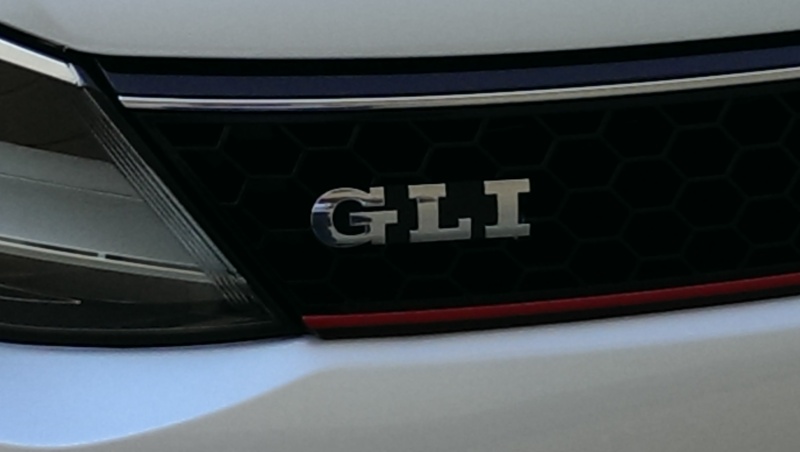 Lets say you like the VW GTI. I know I certainly do. But maybe you are more of a traditionalist that doesn’t want a “hot hatch.” Maybe you like a more traditional sedan profile. You know, four doors with a regular trunk. 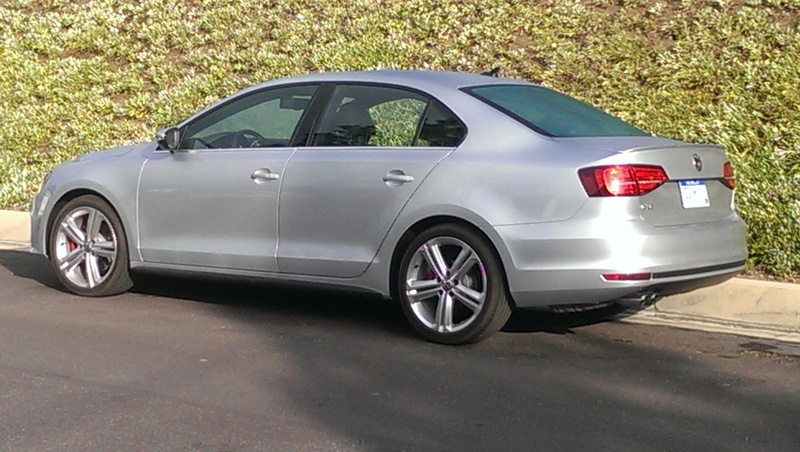 You can have all the GTI good bits in that conventional four door compact sedan package if you want it. 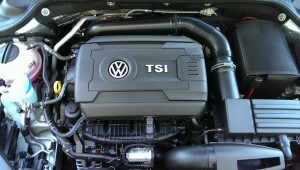 It’s the Jetta GLI 2.0T SE. 2.0-liters and 210 horse, all turbocharged up and ready to go. Among much else, it begins with the GTI’s nearly magical 2.0-liter I-4 Turbo, which spools out 210 horsepower at 5300 rprm, with a meaningful 207 pounds feet of torque at a low down 1700 revs. Which means a wonderfully wide powerband from this engine. 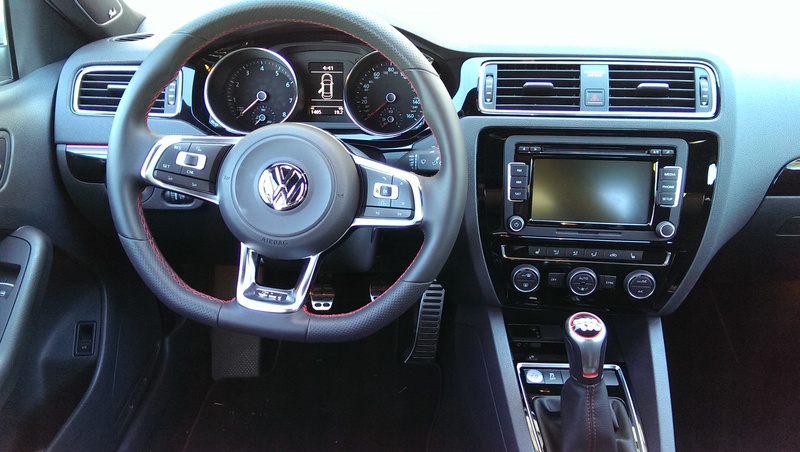 You can mate it to VW’s outstanding DSG dual autoclutch manual/automatic, or an old school stick and clutch pedal 6-speed manual. My Reflex silver had the latter, although having driven both, a lot, I’d have been happy either way. 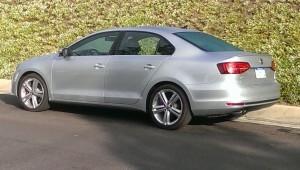 But the pure manual is an ideal match for this car, which is the way I’d buy mine. My car was virtually option free but fully equipped. 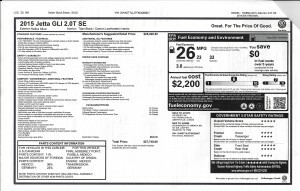 You’ll also note from the window sticker that my tester was a 2015; the 2017 is virtually identical other than overall price levels being about $1000 higher. 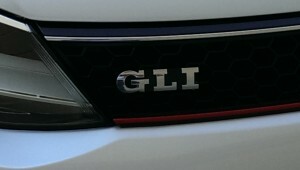 The only addition to my tester’s base price was the mandatory destination fee of $820, for a grand bottom line of $17,740, which included a great audio infotainment system, and all of the GTI suspension bits, superb sport seats, AC and all the power goodies, plus very sporty 18-inch rolling stock. Other than a nav system, this car lacked for nothing in my book. And man was it a hoot to drive. The engine is lusty and strong, with reasonable torque in the mid ranges, then a woosh of power as the turbocharger checks in. You may recall that the old 1.8 used in the GTI and so many Audis was a torqueless wonder, it made pretty good power on the top end, and the tuners used to crank stratospheric high rpm power out of them until they blew up. But below 2500-3000 revs? Nodoby home. This two-liter smooths out the powerband considerably with less gutlessness down low and a more linear feed in of power through the mid and upper regions of the tach. Outstanding, and just ideal for this car. Everything else was in the all good territory; with comfy supportive seats, a logical dash, controls, and instruments layout, and high quality plastics and materials everywhere you look and touch. In fact the fit and finish of the entire car was good too; smooth shiny paint, great even body panel caps, nothing ever appearing unfinished or poorly finished. Drum tight structure too, and not a squeak or rattle to be found or provoked. I’ve worked hard to come up with something meaningful that I didn’t like, and while there’s no such thing as the perfect car, I am saying this car did so more for me that was right, and nothing worth mentioning that was wrong. As you’d expect of a German sports sedan, this thing handles too. The ride quality is good, Germanically firm but never harsh or pounding. Just sold communicative control. I don’t remember any torquesteer talkback out of the steering wheel, just good feel, lots of grip, well controlled body motions, and relatively high cornering limits. Not much to not like here; if you like VWs, and VW performance cars in particular, I suspect you’ll like this too. I’d buy this car with my own money, and be getting a very satisfying machine for around $28K, one that you can drive every day, commute with, haul the gang or family, and rip up the roads with on the weekend. I loved it, and suspect you will too.